Property Details: 2 Bedroom, 1.5 Bathroom Vacation Rental, sleeps up to 5. Coco Plum Paradise house, beach resort home in Marathon. 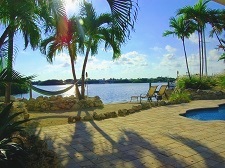 Welcome to Coco Plum Paradise, located in Marathon, FL - the Heart of the Florida Keys. This private Key West-style home sits directly on Bonefish Bay with beautiful water views, deep-water dockage, and direct ocean access. Home has 2 bedrooms, 1.5 baths, living area, dining area, fully equipped kitchen with dishwasher, microwave, and full size refrigerator (water and ice maker). There is also an indoor laundry area with new large-capacity HE washer and dryer A tropical landscaped oasis with mature coconut palms, a private in-ground pool, hot tub, outdoor shower, and a sandy dockside “beach” area. This is a private single-family home, so during your stay, these amenities are provided exclusively for you and your guests. Wake up to spectacular sunrises while watching the dolphins and manatees from the large covered balcony. Enjoy fishing right from the dock. Soak up the midday sun while relaxing poolside or enjoy your own peaceful kayak outing in the bay. Challenge your guests to a round of ping-pong in the enclosed downstairs recreation room that has a seating area, and a full-size refrigerator for entertaining. There's even a large gas grill just next to the pool and rec room so the chef doesn't have to leave the entertainment. Coco Plum Paradise Condo Rental in Marathon FL.